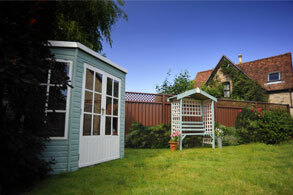 Welcome to ColourFence in Harborough, the provider of the simply stylish ColourFence, ColourRail & ColourGate. To complement our market-leading garden fencing, garden railings & garden gates, we also offer the highest level of professionalism, which we’ve perfected from working within the customer service industry for 35 years. We value your opinion, which is why once we’ve visited you on-site and given you your free no-obligation survey we leave the rest to you. You choose the style to suit your needs. Enjoy your garden with minimal maintenance. When you fit one of our garden fences, railings or gates we promise that they will stand the test of time. All our products are made from galvanised, ColourBond steel which ensures that our range doesn’t rot, rust or weather, leaving less time required to maintain your garden and more time to enjoy it! 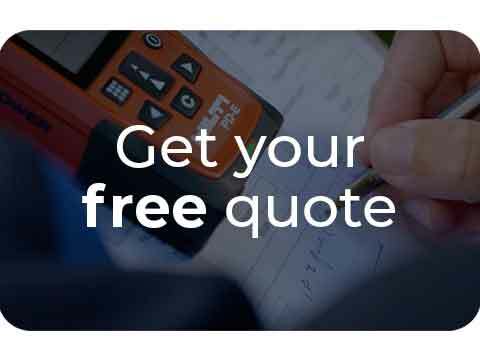 So, if you’re in Harborough or its surrounding areas such as; Aylestone, East Leicester, Melton Mowbray & Rutland and you want to learn more, or you want to us to visit you on-site for a free no-obligation survey, get in touch today and let’s have a chat. I have no hesitation in highly recommending Colourfence. I received a great service from start to finish. James could not have been more helpful and everything was completed with no mess or fuss. My old chicken wire fence and rotting gate have now been replaced with Colourfence and gates and they look great. They are clean, tidy and secure and have the added bonus they never need painting. Thank you James and Colourfence for a great job. "Had 5 panels of 1.8m Brown with trellis and tbh, it looks proper good. All work was carried out professionally, efficiently and as per the quote. Very happy indeed. And what's more the missus loves it, so that's me in the good books for an unspecified number of weeks." 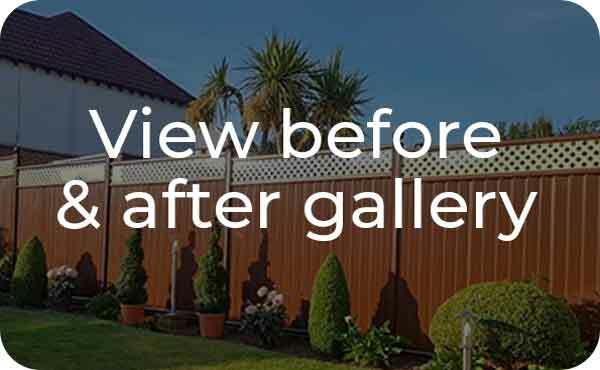 "I can fully recommend ColourFence without any qualms. James and his team are fantastic from quote to installation. The product is superb, looks great, say goodbye to worrying about rotting fences and high winds, guaranteed for 25 years! I have had three installations around my garden perimeter and each time the installation was carried out without mess, and the finished product looks great! James and his team are great to deal with, friendly, knowledgable about their product. I would recommend them without fear, they do a great job." "Our old, falling apart, dreary looking fence was replaced by a smart (as fences go) modern, low maintenance ColourFence by James and Rob; in less than 6 hours (top class job). Next time we need a new fence we will use ColourFence, it is just a great product! The service from start to finish from James was excellent; very helpful and professional, with no pressure; a nice touch was that when installing the fence: they stepped the fence panels so in our garden it looks more eye-catching than a standard level approach; added to that our neighbours think it looks good! Great job!" "Really love my new fence, it is clean, tidy, sleek and perfect. The work was carried out very quickly and efficiently in one and a half days, there was 60ft of fence to remove, cart away and then build the new fence, with finishing touches on the second day. All debris was removed and the site left as they found it. In fact, my whole garden now looks nicer. I am so pleased with my new fence that I have now booked Colourfence to replace my front fencing. Well done ColourFence." "I have just had my new fence done, finished off today. I have had excellent service from James & Rob... from start to finish. My fence looks stunning & is amazing. I absolutely love it. The best thing I ever did was getting this fence, as No painting, No maintenance... just wipe with a damp cloth. Thank you so much colour fence, I am a very happy lady 😀🎉"
"Absolutely delighted with my Colour Fence and Gate. Looks fantastic giving my house excellent curb appeal it has made my property secure with no maintenance. No problems with installation all very professional." "Great service from start to finish. Turned up bang on time to provide a quote. Very clear that there would be no hidden additional costs. Answered (promptly) all the questions I had in relation to the job. Turned up when they said they would to do the job. The job was completed in the timescale originally given. Throughout, they were friendly, polite & trustworthy. Oh and my garden looks amazing with the new fencing. My neighbours love it too. Would highly recommend this company!" "Amazing service did a great job on my fence I would recommend James to anyone who wants a new fence. No hidden charges. Comfortable to leave him alone. Very trustworthy." "From first contact to completion of job, James and his crew were very professional. My job was done when agreed and to a very high standard. Have recommended them to all of my Friends." "Fantastic company! I contacted James and asked for a quote, he was super quick with the quote and gave me all the details I needed. I am in love with my new fence! It looks fab!! Even my neighbours asked for the James’ number. I would 100% recommend to anyone." 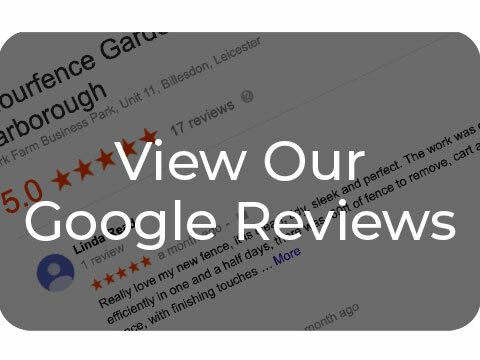 "Excellent service from James on our brand new garden fencing. My friend recommended him after having hers done last year - they still look amazing - and now mine do too! James and Rob took down my old fencing and the new panels were up by the end of the day! Totally transformed my garden and I love it! Thanks so much for a great job guys." 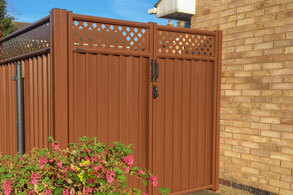 "I want to thank you for the gate and fence panel recently fitted at our property. ColourFence is a very durable and high-quality solution to fencing and we are enjoying its benefits. The prompt and courteous service you provided really left nothing to be desired and it was good to have the old fence and gate taken away afterwards." "Efficient, courteous, quality fencing and exceptional workmanship of James & Rob made two very happy customers. Thank you for working so hard to create our fence design. When we get round to sorting our back garden we will definitely be back." "Just had our new fence done, very pleased with it. lovely colour. reliable & hardworking team." "All aspects of the job from the first phone call were handled very professionally & with a friendly & obliging manner, to the final invoice + guarantee. I will certainly use James & Jasmine's company again if I require more work and also recommend them to others with no hesitation." "Very pleased with result and have no hesitation in recommending your company. Best wishes for continued success." "Done our back fence on Thursday, done an excellent job very satisfied thoroughly recommend." "We had a tricky area in the garden that we were not sure how to get around it, but Jamie sorted this and did a great job. We are so pleased with the fencing and it really makes the garden a lovely place to be. Cannot say enough about how hard they worked, very clean and tidy. 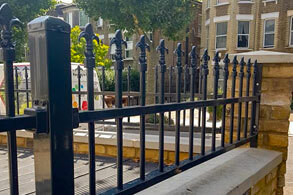 Friendly and helpful, excellent service"
"We are delighted with our railings & gate. Fitted expertly & efficiently. James is a lovely person!" "I love my new fence and thank you very much for a job well done!" "Thank you so much for my new fence panel, absolutely delighted. Again apologies to Robert for having to vanish whilst all the work was ongoing... But what a lovely surprise when I got back. Thank you again for a lovely product and a very efficient service. " "Thank you for an excellent job, especially as having to cope with such hot weather"
"I am very pleased with my new fence. When I have been in my garden, several neighbours have been very impressed. My niece in Yorkshire put me in touch with ColourFence, as her friend had one installed. I never thought I would have cream coloured trellis, and it looks great. Thank you"
"Very impressed by James and assistant, on time and finished work very quickly. They left no mess, took all rubbish away, very polite and professional. Would recommend them to anyone. Thoroughly recommend 100%, well done"
"James thanks for supplying and fitting my ColourFence it looks excellent, and thanks for the way you carried out the work of dismantling my old fence and taking it away and leaving my garden neat and tidy. I would have no hesitation in recommending you should anybody ask about the fence." "Just to thank you for doing my fence and sending the warranty in such a short time. Also thanking you for your punctuality, removing the old fence and the clean work you did." "Great service, really nice guys, did our garden gate and it was a great job, highly recommended." Fantastic! No hard sell. Friendly helpful attitude. James was very attentive, patient with clear knowledge of the product. Very efficient. Very good workmanship… 10/10. "Great job guys! Exactly what I wanted, many thanks"
"From start to finish James and Rob provided excellent customer service, they turned up on time, when they said they would, and the quote was with me in a few days, so well done guys. They are polite and professional, and clear up very well after the job is finished I now have a wonderful green fence and gate, that I know will withstand all weathers, and feel very secure. Also for me, not having to paint it is a huge bonus. I also have peace of mind that if anything does go wrong, James will come and see what he can do to sort out the problem. You can definitely trust these men and I have no hesitation in recommending them." Excellent service, punctual, very neat and tidy, work completed to a high standard. First workmen to not be on their mobile phones all day! Would highly recommend them.